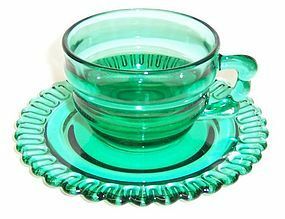 This really pretty Teal Christmas Candy depression glass Cup and Saucer was made by Indiana Glass in the 1950s. The Cup and Saucer are both in very good condition with no chips or cracks. We guarantee items to be as described. Feel free to email any questions. THANK YOU. 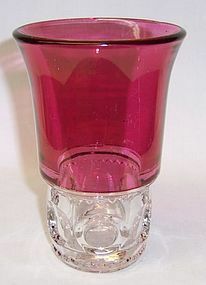 This really pretty Ruby Flashed Kings Crown 5 1/2 Inch high Flat Ice Tea Tumbler was made by Indiana Glass. This Tumbler measures 3 3/4 Inches in diameter at the top and is in very good condition with no chips, cracks or scratches. The Ruby Flashing is very good. Be sure to search our other Kings Crown available. We guarantee items to be as described. Feel free to email any questions. THANK YOU. 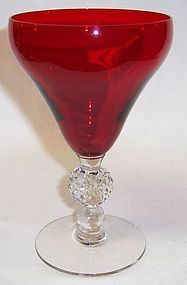 This really pretty Spanish Red Old English, with crystal Golf Ball Stem number 7678, 6 inch high Water Goblet was made by Morgantown. This Goblet measures 3 7/8 inches in diameter at the top. It is in very good condition with no chips, cracks or scratches. We guarantee items to be as described. THANK YOU. This very pretty light blue Radiance Cup and Saucer set was made by New Martinsville Glass from 1936 to 1939. The Saucer measures 5 1/4 inches in diameter. The Cup measures 3 1/4 inches in diameter at the top. Both the Cup and Saucer are in very good condition with no chips, cracks or scratches. We guarantee all items to be as described. THANK YOU. 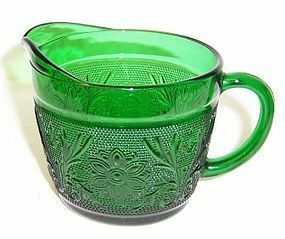 This is a really pretty Forest Green Sandwich depression glass Creamer made by Anchor Hocking. This Creamer is in very good condition with no chips, cracks or scratches. Be sure to search our other Sandwich glass available. We guarantee items to be as described. THANK YOU. This really pretty Marigold Carnival Leaf Chain on the inside of the bowl and Berry with Leaf design on the back of the bowl was made by Fenton Glass. This Bowl measures 6 1/2 inches in diameter X 2 inches high. It is in very good condition with no chips or cracks. The Bowl is not signed on the bottom. Be sure to search our other Fenton available. We guarantee items to be as described. THANK YOU. This is a beautiful Blue Danube Oval 2 Part, divided, Vegetable Bowl made in Japan. This Bowl measures 11 inches wide X 7 1/4 inches across. It is in excellent condition with no chips, cracks or scratches. The Bowl is signed Blue Danube Japan. Be sure to search our other Blue Danube china available. We guarantee items to be as described. THANK YOU. This really pretty ruby red Coin 7 1/2 Inch diameter Round Vegetable or Serving Bowl was made by Fostoria Glass. This Bowl measures 3 1/4 inches high and has the frosted coins. This Bowl is in very good condition with no chips, cracks, scratches or cloudiness. Be sure to search our other Fostoria Coin available. We guarantee items to be as described. THANK YOU. This pretty Forest Green Fire King Kitchen Batter Bowl or Pitcher was made by Anchor Hocking. This Pitcher measures 7 1/2 inches in diameter at the top X 4 3/4 inches high. It is in very good condition with no chips, cracks or scratches. Be sure to search our other Hocking Fire King available. We guarantee all items to be as described. Feel free to email with any questions. THANK YOU. 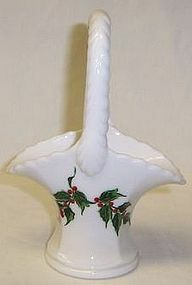 This is a really nice Ivory Christmas Holly 10 inches X 6 inches X 2 1/2 inch high Oval Bowl made by Lenox China. The Bowl has gold trim and is signed LENOX MADE IN USA SPECIAL. It is in really good condition with no chips, cracks or scratches. The Holly design and gold trim is all very good. We guarantee items to be as described. THANK YOU. 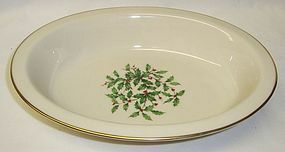 This is a really nice Ivory Christmas Holly 9 5/8 inches X 7 1/4 inches X 2 inches high Oval Rimmed Bowl made by Lenox China. The Bowl has gold trim and is signed LENOX MADE IN USA SPECIAL. It is in really good condition with no chips, cracks or scratches. The Holly design and gold trim is all very good. We guarantee items to be as described. THANK YOU. This is a really nice Milk Glass Line Number 750 Basket made by Westmoreland Glass. This Basket measures 6 1/2 inches high to top of handle X 4 1/2 inches across the widest part. It is signed WG on the bottom and features the hand-painted Holly decoration. It is in very good condition with no chips or cracks. The hand-painted Holly decoration is all very good. Be sure to search our other Westmoreland glass available. We guarantee all items to be as described. THANK YOU. 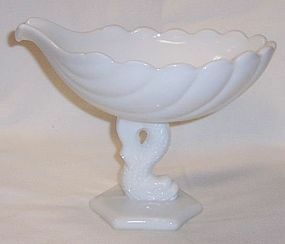 This is a really pretty milk glass Dolphin Foot Shell Comport made by Westmoreland Glass. This Comport measures 6 inches high. The Shell Bowl is 8 inches long X 5 inches across. This Comport is in great condition with no chips or cracks. Be sure to search our other Westmoreland glass available. We guarantee all items to be as described. THANK YOU. 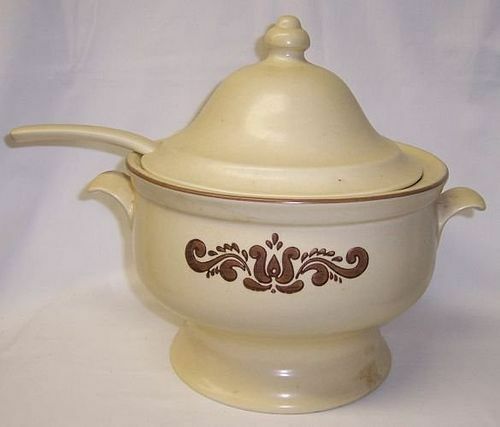 This really nice Village Soup Tureen with Cut Out Lid and Ladle was made by Pfaltzgraff. This Tureen measures 10 inches high to top of the knob on the lid X 8 1/2 inches diameter. It is signed on the bottom Pfaltzgraff USA. The Tureen bottom, lid and ladle are all in very good condition with no chips or cracks. The painted decoration is all very good. We guarantee items to be as described. THANK YOU. This really pretty Vitrock 9 inch high Flower Vase, with Red Flamingos, was made by Anchor Hocking. This Vase measures approximately 5 inches in diameter at the widest part. It is in very good condition with no chips, cracks or scratches. The Flamingo decorations are all very good. This vase can be hard to find. We guarantee items to be as described. THANK YOU. 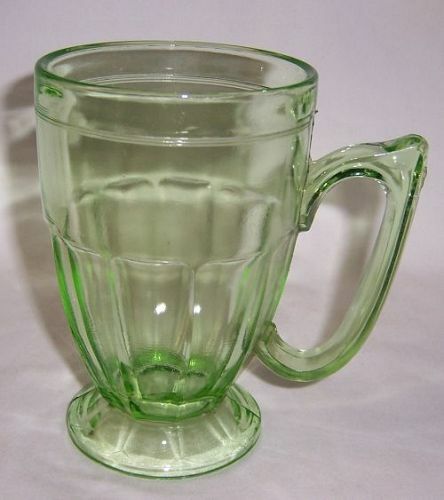 This is a really great Translucent Green Footed, Handled Number 516 Mug made by Jeannette Glass. The Mug measures 5 1/2 Inches high X 3 1/2 Inches across the top. It is in very good condition with no chips, cracks or scratches. This is a hard mug to find. We guarantee items to be as described. THANK YOU. This really pretty green Cube Cubist Candy Jar with Lid was made by Jeannette Glass from 1929 to 1933. This Candy Jar measures 6 1/4 Inches high to top of knob X 3 1/2 Inches in diameter at the widest part. Both the bottom and lid are in very good condition with no chips or cracks. We sure to search our other Jeannette depression glass available. We guarantee items to be as described. THANK YOU. 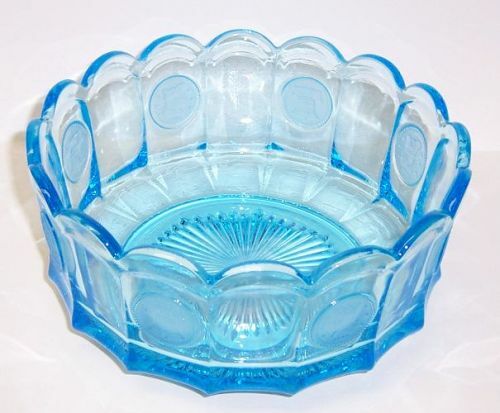 This really pretty light blue Coin 7 1/4 Inch Round Vegetable Bowl was made by Fostoria Glass. This Bowl has the frosted coins. It is in very good condition with no chips, cracks, scratches or cloudiness. Be sure to search our other Fostoria Coin available. We guarantee items to be as described. THANK YOU.